This is a story of high school, of teen friendship and family problems. But it is not a YA novel, being darker than that. The writing is more self-conscious and literary than most YA novels too. Cat is 15 years old when she moves to small town Michigan, and she makes friends with Marlena, who is a little older and more messed up. We know from early on that Marlena will die and that Cat will move to New York and have a successful career but she will also have many difficult times. Cat narrates the story from the perspective of many years later, but also recounting the events as if they are in the present. The unabridged audiobook is performed by Emma Galvin, an actor who has done some high profile audiobooks and who here sounds 15 years old. 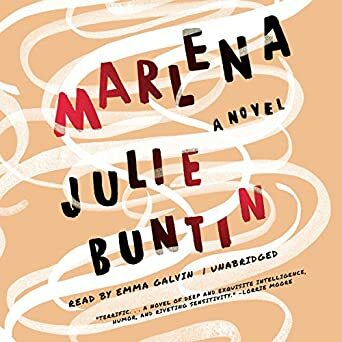 Galvin gives the book energy and character, making it a depressing story easier to get into, although her voice carries a constant edge of anxiety that still makes listening an emotional trial. The story explores dysfunctional families, sexually inappropriate behavior by a father, drinking and drug taking, sexual exploration, and friendship. Cat looks to make friends in her new town, and her mother has plenty of her own problems, so she is essentially alone. Marlena befriends her and gives her a social circle, but also may be leading Cat astray into a dangerous life. Cat has very little contact with her father, and when there are chances that she might be able to see him, she yearns for contact, but he always lets her down. The story has a relentless quality of inevitable unhappiness, where they only solution is to get out of town. There's power in the writing but the reader has to be persistent to get to the end.